Mirror, mirror on the wall who's the fairest of them all. I think almost every girl knows that line from Snow White and how the wicked step mother wanted to be the fairest and how the mirror would tell her she was, until of course Snow White came into her beauty. I, myself, have a magic mirror. I have had the same make up mirror since my college days. I have sat in front of that mirror almost every morning since I was 20 years old either getting ready for class, work or just starting the day. I don't always put on make up since I hate the stuff and as I am getting older for some reason make up is bothering my eyes. The magic isn't in how long the make mirror has lasted, the dial on it won't turn anymore so I am stuck with only one light setting, the daylight setting. I am fine with that setting because I don't ever really remember using the other three settings and I am not a vampire and daylight is not my enemy. The magic of the mirror is how it makes me look. Now remember I said I got it when I was 20 and well now it is 30 years later, yes I am 50 now *okie wonders if that is some sort of record for a make up mirror and thinks it has to be* and the magic is when I use the mirror, for I still see a strong resemblance to the girl I was 30 years ago, albeit the gray hair does show in the mirror and a lovely shade of gray at that. About 5 years ago I started to think my make up mirror is rather magical and within the last year I have determined that it must in fact have some enchanted source of reflectional powers behind it because when I look in any other mirror I look...um *okie tries to think of a word besides old* mature, yes that is it, I look mature. Deciding whether the make up mirror's deceiving qualities are a gift or a curse is something I am tryin to figure out. I wonder if it is a curse because it lies to me, but to think of it as a gift makes much much more sense. This mirror has been more consistent in my life than most anything else and maybe it is some sort of supernatural bond we have that allows it to project a younger face back to me. The mirror has been through God only knows how many relationships and a few engagements and the corresponding break up for every one of those events. It watched me through the pregnancy, birth and raising of my daughter. It has survived multiple moves throughout the last 30 years. It has shared my mornings of grief and my mornings of happiness. In that mirror when I do put on make up I see a bright, vibrant woman who looks only half of her true age. Now the problem comes when I move away from the mirror and catch my reflection in any other mirror and see what is likely truth. I see wrinkles on my face and neck, I see huge bags under my eyes, I see hugely large pores on my cheek and nose area. I see an old woman and feel confused wondering just when did that happen because not 30 minutes ago while looking into my make up mirror I saw nothing like what stares back at me. When I take time to look into a mirror other than my make up mirror my thoughts are always the same as I walk away. I always think "Why is my make up mirror magic and make me feel younger and more confident?". Which is generally followed with "I only wish other people could see me, see my reflection as I see it in my magical make up mirror". Now I must go and think on this subject more and decide if having a magic mirror is a curse or a blessing of some sort. Or maybe it is just one of those twisted cursed blessings that occur from time to time in the fabric of the cosmos. 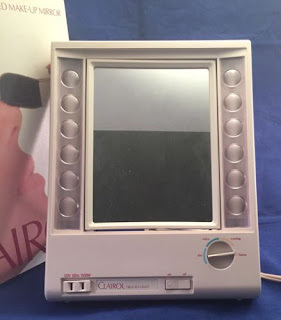 Those were the best make up mirrors ever. I had one, too. Eventually I could no longer find replacement bulbs for it. You can't find anything like these anymore! I had one too. Went out a long time ago, several years after I got married. I too got mine when I was in high school. I am now 65 and have gone through several...seems every one after the original goes out faster than the last. Things aren't made to last anymore! Thank you for posting and sharing. Have been following you since I retired in 2011 and really enjoy you posts. Gosh, I hadn't thought about that make up mirror in ages. Yep, same exact one that I had growing up. I am now 55. Sigh....Feeling a little nostalgic at this point. Where did the time go? I also had a similar makeup mirror (except that mine was pink) when I was in my early 20's. But mine was not magic for me. My eyes are extremely light sensitive ... I never could look into that mirror with those bright lights glaring at me without tearing up. It's pretty hard to put on makeup while you're crying. So instead, I sat on the edge of the bathroom counter and used the medicine cabinet mirror. That probably explains why I was never very skilled at applying makeup. Yes I also had one of those a long time ago, LOL! I figure tomorrow I'll look older than today so enjoy today!